Joe Gallen has told Matty Kennedy to get back to basics and rediscover his attacking threat. The winger has suffered a dip in form after making an impressive start at Pompey. Kennedy was a key player in the opening months of the campaign after arriving from Cardiff on a season-long loan in August. However, the Scot hasn’t had the same impact in recent weeks. 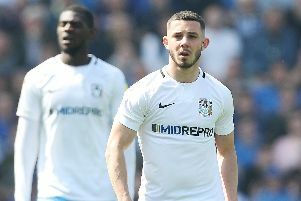 Despite the Blues’ current injury problems, he’s become a bit-part player under Kenny Jackett and was substituted shortly after half-time in the loss to Blackpool last weekend. Gallen has been pleased with the 23-year-old’s overall contribution this term. But Pompey’s assistant manager believes Kennedy has been ‘thinking about things too much’ and must start being more direct. ‘He’s one that I feel, especially in the home games, has always looked a really good threat for us,’ said Gallen. ‘Matty Kennedy has played really well for us but he’s one that has got to get back to basics. ‘He’s got to understand what makes him an effective player and we’ve been working on that with him. ‘Players throughout a season have good times and not so good times. ‘For Matt, in particular, he’s such a positive, bubbly person, but he’s thinking about things a bit too much. ‘He needs to become more direct. ‘We’ve all seen him before when he picks the ball up and goes straight at the opposition with a lot of menace. You can see the full-back is worried. ‘He needs to get back to being positive again and really going at full-backs. ‘That’s what he does best and that will lead to him putting the ball into the box. ‘Matt’s put crosses in that have lead to goals – Brett Pitman’s against Southend is an example – while he was great when he scored against Northampton at home. ‘He’s played very well for us and he’s just had a little dip. ‘We need to help him get out of it. Overall, Matt’s on a bit of a dip, but who doesn’t go through a full season without one? ‘He’s just got to get back to basics again and going at full-backs with pace. Kennedy’s contract at Cardiff runs out this summer. Pompey have a clause in place to make the former Everton winger a permanent player if all parties can come to an agreement. Gallen revealed the Blues will make a decision over Kennedy’s future at the end of the season. He added: ‘Matt’s our player until the end of the season. Then we’ll take stock of things and then decide. ‘It’s difficult to speak to Cardiff.